KBP7-G in Providence saw Providence Bloc clash with Mercenary Coalition [MC]. The fight was fought over Providence Bloc’s infrastructure as Mercenary Coalition continued its campaign in the region. Mercenary Coalition with the aid of Shadow Cartel [SHDWC] and Did he say Jump [JMP-N] had a joint Machariel battleship fleet against Providence Bloc’s Nightmare battleship fleet. Providence Bloc proceeded to bring capitals to the field. 9-F0B2 in Providence saw Mercenary Coalition and Providence Bloc clash again in battle over a tower in the system. The two sides brawled in an impromptu capital fight and later reshipped and met again over the tower. Providence Bloc brought a Nightmare fleet against Mercenary Coalition’s Machariel fleet. 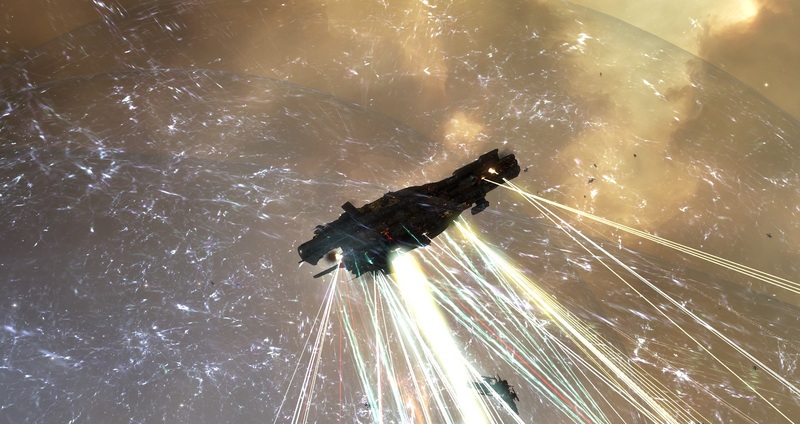 I-UUI5 in Fade saw a battle sparked over a Pandemic Horde [REKTD] Rorqual industrial capital ship. The ship was tackled by Guardians of the Galaxy (GotG) forces who brought a Ferox battlecruiser fleet to destroy it only to be met by a Pandemic Horde rescue fleet consisting of Hurricane battlecruisers. Oijanen in The Forge saw Drone Regions Federation (DRF) forces clash with a Snuffed Out [B B C]\Project.Mayhem. [16-13] over a citadel in the system. The DRF brought a Machariel fleet against Snuffed Out\Project.Mayhem.’s Proteus strategic cruiser fleet. During the fight HOTDROP [DR0P] alliance brought a capital squadron to assist Snuffed Out\Project.Mayhem. in the fighting, resulting in the DRF bringing its own capitals to the fray and starting a secondary capital brawl. A Fortizar citadel belonging to Circle-Of-Two [CO2] in Sendaya in Derelik saw a Pandemic Legion [-10.0] combat carrier fleet engage Circle-Of-Two’s Proteus fleet over multiple systems in the Curse region. LBA-SO in Immensea saw Phoenix Federation (PF) destroy a Revenant super carrier belonging to The Therapists [CURE] in a battle that was sparked over an Asteria Concord. [ACORD] Rorqual industrial capital ship. X6AB-Y in Providence saw Providence Bloc defend an Azbel engineering complex from Northern Coalition. [NC] and Pandemic Legion. Providence Bloc brought a Nightmare fleet against Northern Coalition. and Pandemic Legion’s separate Proteus fleets. Bosboger in Heimatar saw bitter fighting over a Did he say Jump tower as a Siege Green. [SSGRN] Machariel fleet confronted a Did he say Jump Machariel fleet guarding the tower’s repairs. The two sides escalated to combat carrier and before long involved their two allies, Lost Obsession [FATE] and Shadow Cartel respectively. Before long the tower grid became a site of a major capital battle. I have been checking out some of your articles and i can state pretty good stuff. I will make sure to bookmark your website. Good V I should definitely pronounce, impressed with your web site. I had no trouble navigating through all tabs as well as related info ended up being truly easy to do to access. I recently found what I hoped for before you know it in the least. Quite unusual. Is likely to appreciate it for those who add forums or something, web site theme . a tones way for your client to communicate. Nice task.. I have to show my appreciation to you just for rescuing me from this problem. After exploring through the world-wide-web and obtaining techniques which were not helpful, I believed my life was over. Living minus the answers to the issues you’ve fixed all through the short post is a crucial case, and ones which could have in a negative way affected my career if I hadn’t come across your web site. Your primary mastery and kindness in taking care of all the pieces was very helpful. I’m not sure what I would’ve done if I had not come across such a step like this. I’m able to at this time relish my future. Thanks a lot so much for the skilled and results-oriented help. I will not hesitate to propose the sites to any individual who would like guidelines about this subject. Somebody stated that you had to get a domain name, or your blog sites weren’t seen by everybody, is that real? Do you recognize what a domain name is? IF not do not answer please. What are the most effective free blogs that allow user-sponsored marketing and sales? Hi, Neat post. There’s an issue together with your web site in internet explorer, could check thisK IE still is the market chief and a huge component of other folks will omit your wonderful writing because of this problem. Where online can a certified psyciatrist blog post articles (or blog sites) for them to come to be prominent?